Adopted on March 21, 1941. The American elm, (Ulmaceae Ulmus americana,) was adopted as Massachusetts official tree on March 21, 1941 to commemorate the fact that General George Washington took command of the Continental Army beneath one on Cambridge Common in 1775. It is a large tree, with gray flaky bark. 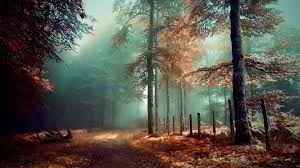 When growing in the forest it often attains a height of 120 feet, but in the open it is wide-spreading and of lesser height. 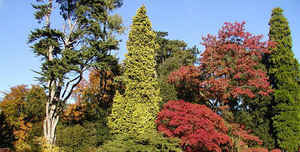 The leaves are oval, and dark green, turning to a clear yellow in the autumn. The American Elm, like most elms, has been severely afflicted by Elm Disease. Ulmus americana, generally known as the American elm or, less commonly, as the white elm or water elm, is a species native to eastern North America, occurring from Nova Scotia west to Alberta and Montana, and south to Florida and central Texas. The American elm is an extremely hardy tree that can withstand winter temperatures as low as −42 Â°C (−44 Â°). Trees in areas unaffected by Dutch elm disease can live for several hundred years. 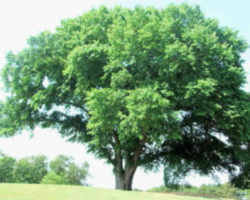 American elm is most notable for its susceptibility to the wilt fungus, Ceratocystis ulmi. Commonly called Dutch elm disease, this wilt has had a tragic impact on American elms. Scores of dead elms in the forests, shelterbelts, and urban areas are testimony to the seriousness of the disease. Because of it, American elms now comprise a smaller percentage of the large diameter trees in mixed forest stands than formerly. Nevertheless, the previously developed silvical concepts remain basically sound. American elm also known as white elm, water elm, soft elm, or Florida elm. Leaf: Alternate, 3 to 6 inches long, 1 to 3 inches wide; margin coarsely and sharply doubly serrate, base of leaf conspicuously inequilateral; upper surface glabrous or slightly scabrous, paler and downy beneath. 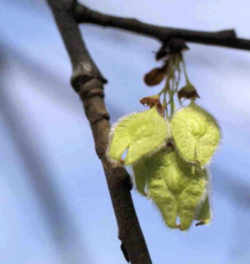 Flower: Appears March to May before leaf buds open, in fascicles of 3 to 5. Fruit: Rounded samaras, 3/8 to 1/2 inch across, deeply notched at apex, hairless except for margin; appears April to May. 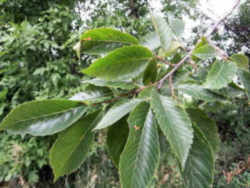 Twig: Slender, glabrous, slightly zigzag, reddish-brown; buds over 1/4 inch long, reddish-brown with darker edged scales, often placed a little to one side of the twig. Bark: Dark, ashy-gray, flat-topped ridges separated by diamond-shaped fissures; outer bark when sectioned shows distinct, alternating, buff colored and reddish-brown patches. When young it is often quite spongy. Form: In the open, the trunk is usually divided into several large, ascending and arching limbs, ending in a maze of graceful drooping branchlets. The law designating the American elm as the official Massachusetts state tree is found in the General Laws of Massachusetts, Part 1, Title 1, Chapter 2, Section 8. Section 8. 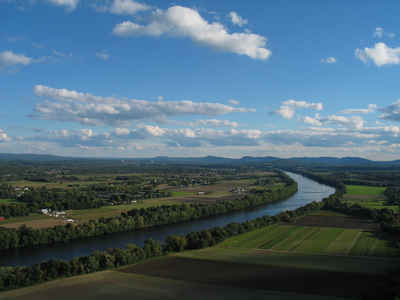 The American elm (Ulmus americana) shall be the tree or tree emblem of the commonwealth.